Why hello! My name is Chigua. Can you guess what that means? If you said Chihuahua, then you are right! 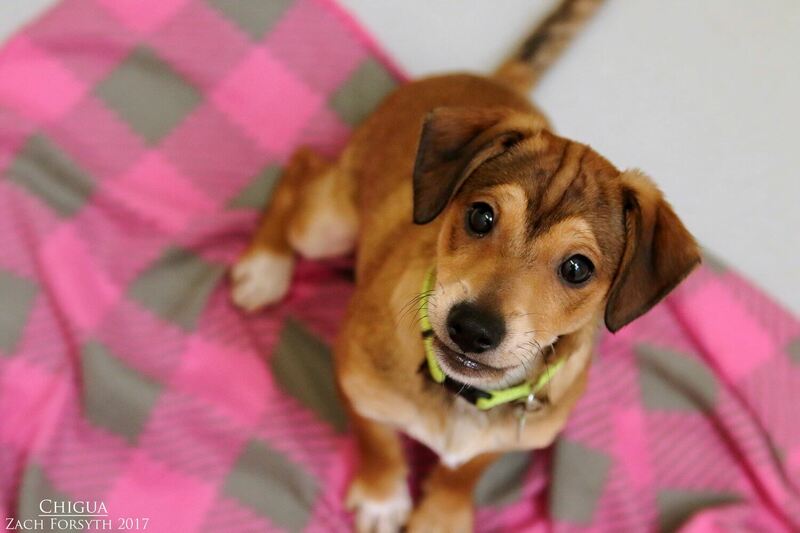 I am a 3 month old, 9 lb Chihuahua/Terrier mix with a heart of gold. I am a little bit of a sensitive girl as the world is all new to me, but I really LOVE to play with other puppy pals, so a confident dog buddy to show me the ropes would be great! Kitties are still new to me, but I wouldn’t mind having one around. After a few treats and some love, I am ready to bond with my human friends over the age of 8. Full of wiggles and cuddles, I am ready to start the day of fun and adventures, ending the night with a nice snuggle session on the couch as we watch some T.V.! I am a very quick learner and am ready to dive into the basics, as PUPPY CLASSES ARE MANDATORY FOR MY ADOPTION. Sweet, adorable, playful and sensitive, I am just a little chica looking for my familia. Will it be yours? Fill out an application today, so we can meet. I come to you spayed, vaccinated, micro-chipped with an adoption fee of $350..